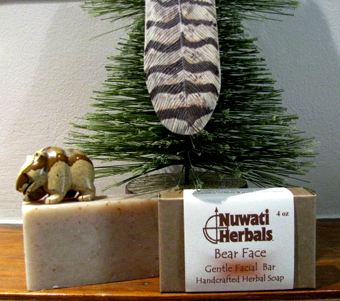 Bear Face is an especially great facial bar. The shea butter, honey and oats in this bar will gently exfoliate and moisturize your face and skin. Emerge from your cave ready to show the world your 'Bear' Face! Note: Nuwati soaps only use certified organic palm oil from South American countries that is grown and produced using high levels of sustainability. Nuwati soaps do not source any palm oil out of southeast Asia or Indonesia where there is a basic problem of deforestation and diminishing animal habitats.